tengo que subir estos a algún momento… de repente sin intentar, aquí está un cuadro mío que hice para Café Olé en Main Street, Newark DE. Si estés por Newark, Delaware, ¡visita este lugar, por mis cuadros se quedan hasta al final del mes de septiembre! Well… at some point I needed to upload my 12 oil paintings that I did this summer… here is one! The final version is not here just yet… will put it up some point within the month…. come see my 12 paintings inspired by Granada, Madrid, & Córdoba at Café Olé on Main St, Delaware, this month!!! (Indefinite as to how long they will be up, but definitely through this month). darla un toque de ser humano al panorama. 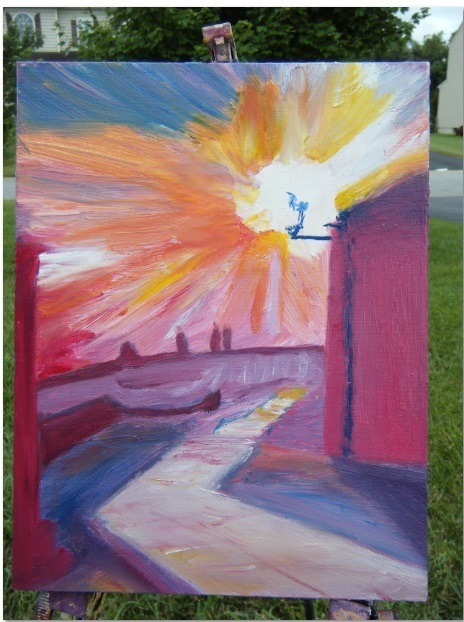 The sunset painting was inspired from a hiking adventure when I was in Granada. That following spring, I decided to make a water coloring of it, and for this series, proceeded to make an oil painting. I loved how the colors came out.. But something was missing- I put two small faint envisions of a couple down the path to add a human touch to the epic scene. 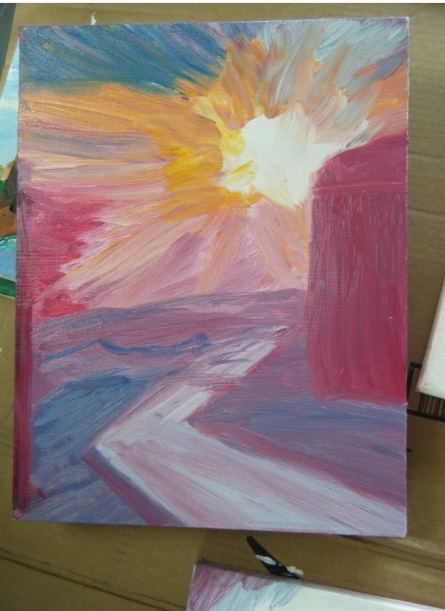 This entry was posted in Delaware, Elena´s World Series Oils- mis oleos and tagged España, Granada, Puesta de sol, Spain. Bookmark the permalink.